Social media is a tremendously powerful marketing tool. Are you convinced that you need to use it yet? No? That’s what I thought. Luckily, I have statistics to back it up. Six in ten online adults have Instagram accounts. What’s more, 15 million registered businesses using Instagram business profiles. Did you also know that in March 2017, over 120 million Instagrammers visited a website, got directions, called, emailed, or direct messaged to learn about a business based on an Instagram ad? Those are pretty powerful statistics alone. Now, most of you probably already have an Instagram account for your business but are looking to improve the results from it. The statistics around Instagram look fancy and all, and there are plenty of case studies of brands who have implemented Instagram in their marketing strategy and generated millions in sales from it. At the same time, you are struggling to get a few likes and followers, right? Well, the thing is that Instagram results doesn’t come over night. Nor do they come without a clear strategy and hard work. 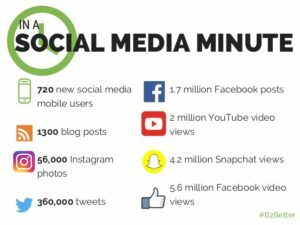 When looking at the statistics, Instagram is a vital place to be as a brand considering all the benefits you’re missing out on, if you aren’t using the platform. However, the sad truth is that unless you have a clear strategy, you won’t be able to achieve the results you are seeing other brands achieve. Luckily for you, in this article, I’ll list my favourite and most effective tricks to use on Instagram to generate results. All of the tricks listed are true and tested by the brands you are seeing case studies from, so we know they work. Instagram is a visually driven platform. There’s no going around it. Visuals are hotter than ever, especially on social media. In fact, we can see posts made on platforms that are mainly dedicated towards text generating much better results after having implemented images. 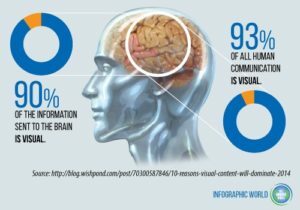 There’s no question why visual content works so much better than pure text. And that’s also why Instagram has grown to become so immensely popular. Now, why should you put all your effort towards creating high-quality content? First of all, Instagram is dedicated towards it. The only thing you can post on Instagram is visuals, in one way or another. You might post videos, you might post so-called Boomerangs, but they are all based on visual content. This means that the content you share will play a huge part in the success you see on the platform. The better content you share, the better results you’ll generate. I promise you that. I’ve seen so many brands not having a strong visual content strategy on Instagram and unfortunately, they won’t do anything else but fail on the platform. Until they improve their content, that is. Another reason that creating amazing content on Instagram is so important is because of competition. Every day, 95 million photos and videos are shared on Instagram. Think about that for a second. What does this mean more concretely? It means that the competition to getting your content seen on Instagram is though than ever. The only way to stand out is to create content that is more appealing, and higher quality than the content everyone else is sharing. It might work for celebrities to post low-quality content, but it won’t work for your brand. Because people aren’t following celebrities for the quality of the content they share. They follow them because they look up to them, and because they want to see what they are up to. The main reason people are following brands (with a few exceptions) is because they want to see the content you share. The quality of her images isn’t always the best, and some can even be of low quality. Yet still, she has over 113 million followers! That’s because people follow her because it is just that: her. They don’t care about the quality of her content. They just care about the content. Yes, some are lucky, but for the rest of us, creating amazing high-quality content is everything when it comes to Instagram success. Without it, you’ll have a hard time attracting followers, and it will keep you from reaching your true potential. Blurry images aren’t always the result of a bad camera. It can also be the result of an un-stabilized camera, a photo with the focus in the wrong place, or an image with no focus at all. To take a non-blurry image, make sure you have a tripod if you know you are shaky when holding the camera, and make sure that the focus is put on the object that you want to photograph. Very similar to the point above, yet different. Low-quality images can be a result of the facts mentioned above, but most of the time, it’s a result of a bad camera. It says itself. If you want the content you share on Instagram to reflect your brand, what does sharing low-quality images reflect? That your products are low-quality? A good camera isn’t very expensive today. In fact, your phone will do a very good job in many cases. However, if you want to take the quality of your images to the next level, investing in a DSLR camera is to recommend. You never want to share images that look like they were photographed using a potato. Back in the days, you could manage sharing low-quality images on Instagram, because most of the people were doing it. Also, the competition weren’t that tough because Instagram’s user count wasn’t that high. However, with the easy access to cameras that take high-quality images, there’s no good explanation to why you are still posting low-quality images. One of the biggest factors that can impact that quality of your photos, is lighting. The recipe to taking beautiful photos is having as much natural light as possible. Sure, if you have a studio with professional lighting, reflecting films etc, then “artificial” light can create some amazing pictures. But that demands quite some skills both photography wise and editing wise. For most business owners, this is skills that they don’t have. And to learn taking those kinds of images simply takes too much time! Images with lightning also tend to get a higher engagement than dark images. The bottom line is that natural lightning is always a safe bet. When starting out, knowing what you should post is difficult. It’s easy to be struck by an idea draught and stand there not knowing what or how you should post. In these cases, a smart trick is to look at the content your competitors are posting. When you are starting out, your competitors will reach you a lot about the styles and formats of photos you can use for your very own content. Simply look up a few of your competitors on Instagram, screenshot what ever pictures catches your attention and try to replicate them. If you ask me, engaging and interacting with your audience is one of the single most important parts of Instagram success. It might now be as important when it comes to growing your followers, but it is vital for both followers and customer retention. It is also tremendously important to getting loyal and supportive followers. This goes for whichever platform you use. It is important that you take the time to engage with your audience. The easiest way to engage with your audience is to respond to their comments. You’d be surprised how far a simple “Thank you” can take you. Why? Because it shows that you appreciate your audience, that you care about them, and that you acknowledge them. People will also ask questions, and when it comes to these, it’s even more important that you respond, and that you respond in a timely manner. As a brand, you’ll receive tons of questions about your products, shipping, orders, etc. 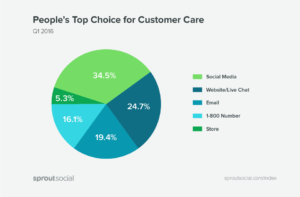 And that’s no surprise considering the fact that 34,5% of people prefer social media for customer service. Social media really is the new customer service tool. When you respond to questions quickly, it helps build your reputation, and a simple and small thing like this can help you drive sales, because people tend to trust brands who respond quickly more than those who respond slowly. The bottom line is that you need to respond to every single message you receive on social media. If it is a customer complaint, you need to make sure you respond as quickly as possible, because responding quickly to a disgruntled customer shows that you take their complaint seriously. In fact, if you succeed in resolving a complaint in the customer’s favor, they will do business with you again 70% of the time. Even if someone comments a thumbs up emoji on your post, you need to respond to them and show your appreciation. Now, Instagram also gives you the opportunity to “like” comments to show your appreciation, and this can be very helpful if you have a lot of comments to respond to. But again, nothing beats personal interaction, and you’ll be better of proving an answer rather than liking their comment. Just like you know how you want people to conceive your brand, you want to have a consistent brand message on Instagram to help empower your message. These should of course be the same. If you want people to see you as a positive and exciting brand, you, of course want to mediate that feeling with your Instagram. In short, your Instagram account should be an extension of your brand that shares your brand personality and message. First and foremost, this means sharing posts that are coherent and consistent. Simply put, you should share posts that look similar to each other while still being different. It sounds complicated, but it’s really not! 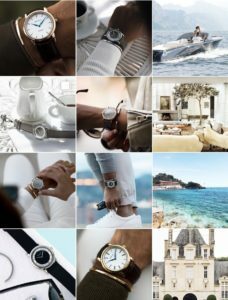 My favourite example is @CornicheWatches. Can you see how the style of their images look similar, while the motive is different? 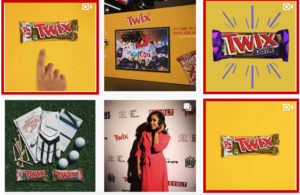 This is a prime example of a brand who successfully share a consistent brand message on Instagram with their content. The feeling you get when you visit their page is exactly the feeling they want you to get. The feeling you want t have when wearing their watches! Something worth mentioning is that having a consistent brand on Instagram doesn’t only relate to the content you share. It also includes things like the captions you use, and the consistency of your posts. When you have a unique and consistent brand on Instagram, it will be easier to stand out from the crowd, and you’ll generate brand-awareness easier. Did you know that 60% of the top brands on Instagram use the same filter for every post? If you are editing your images, you know that you can do quite a lot to them. Maybe you want to have super high saturation on all your images, or maybe you want to make your images super bright? The great thing about Instagram is that it has an integrated photo editing tool that you can use before posting an image. While it isn’t as advanced as photo editing tools like Lightroom or Photoshop, it has some very useful tools you can use. When you use this method, you should of course not just share the same image over and over again, because then you’re screwed. Fairly quickly, people will lose interest and unfollow you. And you will definitely not attract any new ones. What this means is that you share a similar type of images. Maybe you only want to share product images, and that’s fine. If you do, people will instantly be able to recognize your brand for the type of style you have on your posts. Having a consistent brand also means that your target audience will resonate better with your account. When you share a message that is relevant to your brand, the people you are targeting will naturally be attracted to your brand, and start following you. Influencer marketing has exploded in popularity over the last couple years. Just look at how the Google searches for “Influencer Marketing” has skyrocketed. What has allowed influencer marketing to flourish is social media? Today, anyone can become a social media influencer. It just demands hard work, great content, and a consistent strategy. Back in the days, the influencers were celebrities, and people looked up to them like gods. 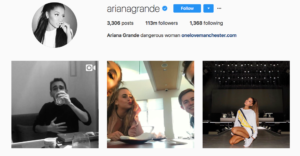 While celebrities still have a lot of influence, studies have found that many consumers tend to trust social media influencers above celebrities. Of course, influencer marketing hasn’t just increased in popularity because there are more influencers. No. It has increased in popularity among brands because of the results it’s able to generate. This is a clear sign of the huge influence social media influencers have over people. These are results that not many marketing sources can compete with, so it doesn’t come as a surprise that its popularity has skyrocketed. What exactly is an influencer marketing campaign? Well, in simple terms, influencer marketing is the use of influential people on social media to promote your brand. Now, if I would go into detail on every single part of influencer marketing we’d be here all day. Because there are so many aspect to creating a successful one. to knowing how much to pay. Therefore, I’ll run the turbo version. This is essential for a successful influencer marketing campaign. The influencer you partner with will determine a lot of the success of the campaign, and therefore, you want to partner with someone who resonates with your brand, is tin the same niche as you, and have followers which are also your target audience. Identifying suitable influencers used to be tough. Really tough. In fact, 75 percent marketers said finding the right influencers was their most significant challenge. Luckily today, you have influencer tools like Veloce Network that allows you to filter and search among thousands of influencers based on your preferred criteria, so that you can find influencers who matter the most to you. The best part? It can be done in a matter of seconds. When you partner with influencers who resonate well with your brand, your campaign will automatically come off as more authentic because the influencer could actually use your product even if they weren’t being paid for it. To learn all about influencer marketing, read Veloce Influencer marketing blog. Instagram has over 1 million monthly active advertisers. That’s quite a large number. It is also proof that Instagram ads work. If they wouldn’t, nobody would use them! Since Facebook now owns Instagram, the Instagram ads you create are made through Facebook’s very intelligent targeting features. To create a successful Instagram ad, you first need to know a few things. First of all, what are your goals? If you’re familiar with setting up Facebook ads, you’ll recognise yourself very well, because they, as mentioned, use the same interface and process. If you want to increase brand awareness, your ad will look different from and ad that has the purpose of driving sales. The structure will also be different because those with the objective of driving sales tend to be more direct. 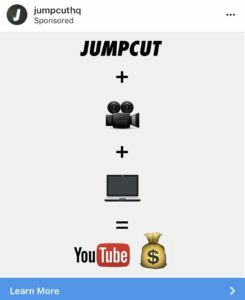 This ad from Jumpcut studios is a clear “drive conversions” ad. It has a clear Call to action button which then directs you to a landing page with a free offer. Landing pages with free offers are created to ultimately lead to a conversion because they collect things like emails, or offer a free trial month etc. 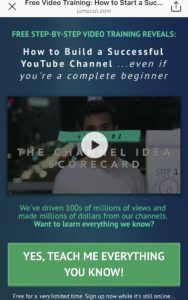 Because they contain all of these parts, it’s an Instagram ad done in the right way, and the way you should, if you’re looking to drive sales. Two very important things you need to know when setting up your ad is who you are targeting and what ad you have created. These two will have the most effect on how well your ad performs. The beauty about ads is that the principle about creating amazing content still applies when making an ad. Have an image that is high-quality and reflects your brand and you’ll generate great results most of the times. If all the other parts are done correctly, that is. Creating an ad where you get the most bang for your buck isn’t easy. That’s why it is always recommended that you , in the beginning, create several different ads with different targeting demographics, different images, different calls to actions etc, and spend little money on all of them. When you have figured out which ad is the best, you can increase your spending on it and ignore the rest that weren’t as effective. Therefore, before you set up your campaign, you need to know exactly what you want to achieve before pouring money into it. When you’ve chosen your objective, it’s time to choose things like location of the people you are targeting, interests, ages, and gender. You’ll also set your ad budget and decide how much you want to spend a day. 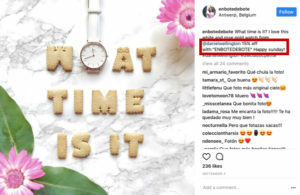 You can create your own Instagram ad here, and learn everything about it, because really, setting up an Instagram advert is an article itself. To reach success on Instagram, there are a few rules you need to follow. These rules lay the foundation to a successful social media strategy and great results. To see results from Instagram, you need to invest both time, effort, and money into the platform. You also need to focus on following the true and tested principles of Instagram, and stay updated to what these are. What is your favourite method to get results on Instagram?